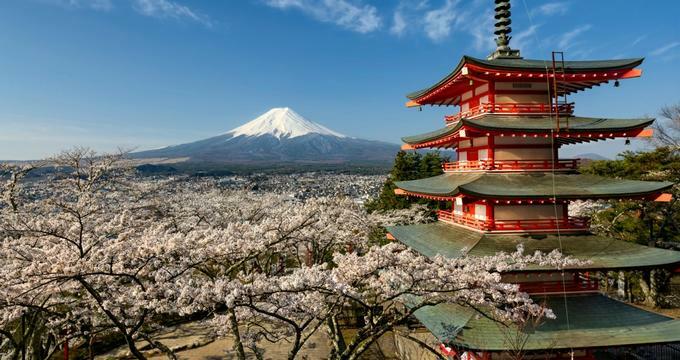 With its dynamic cities, snow-capped mountains, and awe-inspiring temples, Japan offers a fascinating blend of ancient culture and dazzling modernity. There's plenty to do here, and the country's many bullet trains make it easy to zip from one destination to the next; plan to dine on sushi and sake, visit one of the 21 UNESCO World Heritage Sites, and relax in a bubbling hot spring after enjoying some of the country's world-class skiing. There's no doubt that visitors to Japan will be spoiled by the incredible array of things to see and do, but here are 25 of the best. In traditional Japanese culture, the Seven Lucky Gods are believed to bestow good fortune, and they can be seen in engravings and other pieces of artwork all over the country. However, few of these replicas are as impressive as the Forest Of Seven Lucky Gods, which is home to giant wooden sculptures of each of the gods. The seven sculptures are made out of wood from trees that were more than 1,000 years old when they were first carved. A small shrine sits at the feet of each god, and the forest provides a wonderfully tranquil setting for meditation and prayer. 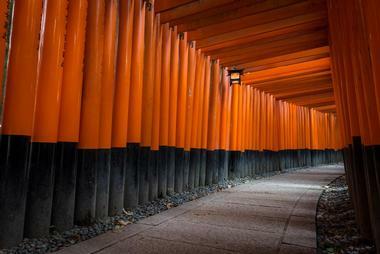 Sitting at the base of Inariyama Mountain, Fushimi Inari-taisha is the most important and impressive shrine in Kyoto. The complex is made up of five primary shrines, but many smaller ones line the 4 km path that leads up to the top of the mountain. The peak of the mountain is 233 meters above sea level, and the walk is fairly difficult and takes most visitors approximately 2 hours. The hundreds of stone foxes found throughout the shrine are another interesting feature; the Japanese believe that foxes are the messengers of Inari, the deity of rice. 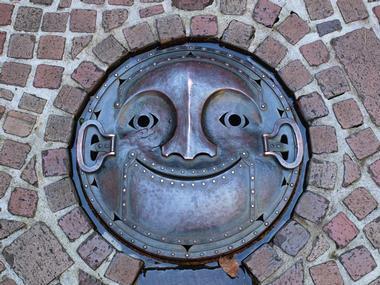 Studio Ghibli in Tokyo is one of Japan's best-known animation studios, and the Ghibli Museum was created with the intention of allowing visitors to immerse themselves in the unique, imaginative world depicted in the company's films. The museum is dedicated to the art of animation, but it feels like a cross between a children's playground, a technology expo, and a fine arts museum. Highlights include a rooftop garden, a replica of the Catbus from the movie My Neighbor Totoro, and a short film that can only be seen in the museum's theater. There is no ticket office at the museum, so tickets must be purchased in advance. 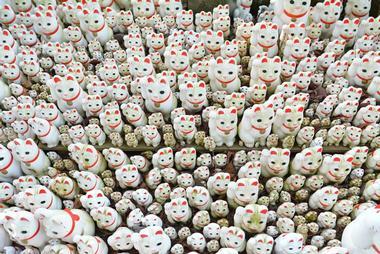 Most people familiar with Japanese culture will have seen their fair share of maneki-neko, or beckoning cats, but the collection of these ornaments to be found at the Gotokuji Temple in Tokyo is truly impressive no matter how much time you've spent in the country. 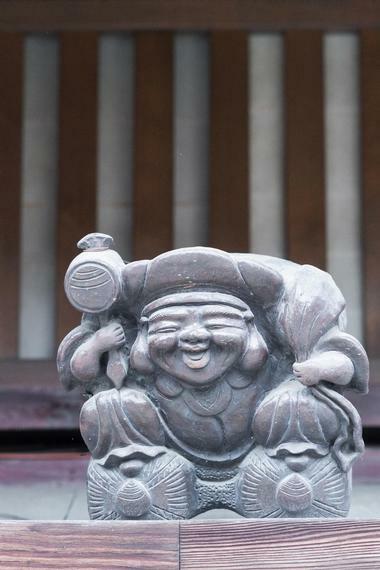 According to legend, this Buddhist temple was the birthplace of the famous good luck charm, and hundreds of them are on display throughout the temple, the grounds, and even the streets leading to the temple. The temple is open every day between 6:00am and 6:00pm, and there is no charge for admission. 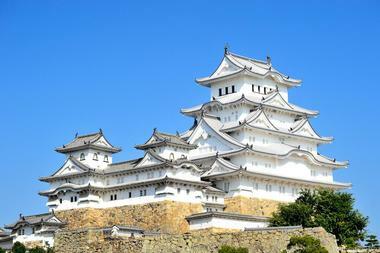 Also known as Shirasagijo, or White Heron Castle, Himeji Castle is the largest castle in Japan and is widely considered to be the most remarkable castle in the country. The complex consists of more than 80 buildings connected by a succession of gates and pathways, the construction of which took place from 1333 to 1609. Visitors typically enter the castle through the Otemon Gate, which leads into an admission-free lawn lined with cherry trees. From here, anyone wishing to explore the castle in more depth can pay an admission fee and pass through the Hishi Gate into the main keep. One of the city's most prominent landmarks, the Hiroshima Peace Memorial is the only surviving building to stand on the spot where the atomic bomb was dropped on August 6, 1945. The building has been a UNESCO World Heritage Site since 1996, and it serves as a memorial to the more than 140,0000 people who were killed by the bomb. 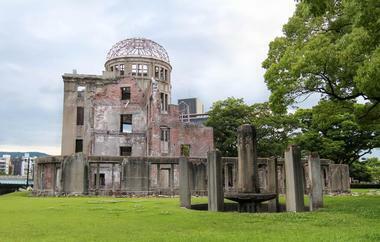 It's also known as the Atomic Bomb Dome or A-Bomb Dome, and can be found in the beautiful Hiroshima Peace Memorial Park alongside the Hiroshima Peace Memorial Museum and the Cenotaph for the A-Bomb Victims. Hidden away in the remote Shogawa River Valley, the Historic Villages of Shirakawa-go and Gokayama have been a UNESCO World Heritage Site since 1995. Spread out over an area of 170 acres, the villages are best known for their traditional farmhouses, some of which were built more than 250 years ago. 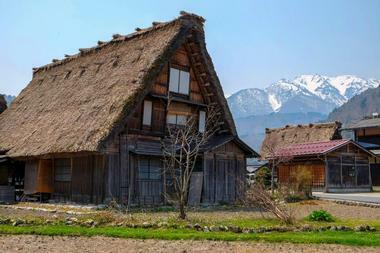 Known as gassho-zukuri, the houses have steep thatched roofs designed to withstand the region's typically heavy snowfall. It's possible to visit the town on a day trip from Takayama, but anyone with enough time can choose to spend the night in one of the farmhouses. 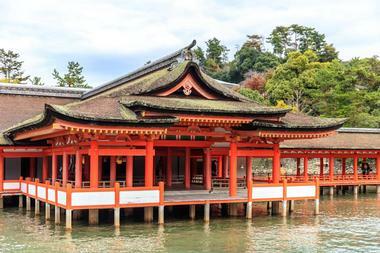 Built in honor of the three daughters of the Shinto god responsible for seas and storms, the Itsukushima Shrine is a Japanese National Treasure located on the island of Miyajima. 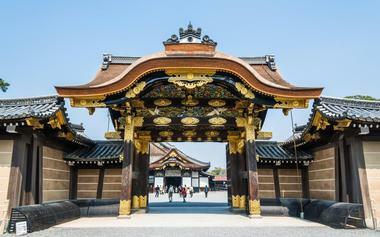 Made of camphor wood, the shrine was first constructed in 593 AD, but has been rebuilt many times, most recently in 1875. 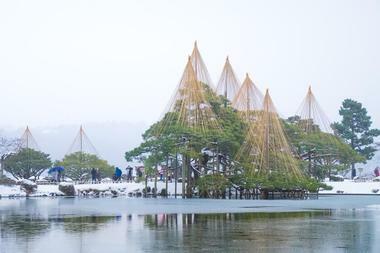 It stands on a set of piers over the Seto Sea, and seems to float in the water at high tide. Boat tours of the bay are offered at high tide, but some visitors prefer to go during low tide, when they can walk right up to the base of the shrine. Jigokudani translates into English as “Hell's Valley,” but Jigokudani Park doesn't contain the fiery pits you might imagine. 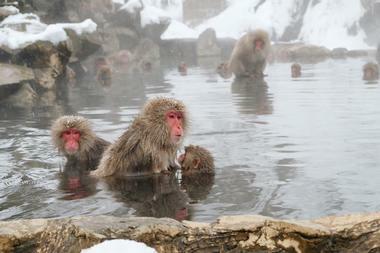 Instead, the park offers the unique chance to observe wild monkeys relaxing in a natural hot spring. The monkeys that live here are Japanese macaques, sometimes known as snow monkeys because they are the only non-human primates to live this far north. The monkeys are quite accustomed to humans, but visitors are not permitted to touch or feed them. The park is open all throughout the year, but the best time to visit is during the winter months when the ground is covered with snow. 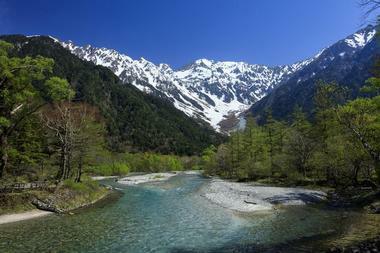 Part of the Chubu-Sangaku National Park, Kamikochi is an 18 km valley that offers spectacular views of some of Japan's most impressive mountain scenery. There are plenty of hiking trails that allow visitors to explore the valley and the surrounding mountains, and accommodation options include both campgrounds and hotels. The park is only open between mid-April and mid-November, and is particularly busy during July, August, and October. Private vehicles are not permitted to enter the park beyond the Kama Tunnel, but visitors may leave their cars in one of two parking areas and take a shuttle bus or a taxi to the visitors center. One of Japan's three most beautiful landscape gardens, Kenroku-en was created by the royal Maeda family and has been open to the public since 1871. More than 180 different species of plants can be found here, and they have been carefully arranged so that the gardens have a different look for each season. 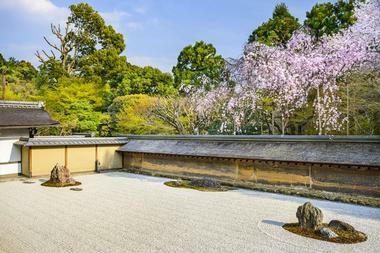 In addition to the 11.4 hectares of gardens, the property is home to the oldest fountain in Japan, a teahouse that dates back to 1774, and the beautiful Kaiseki Pagoda. The gardens are open all throughout the year from dawn until dusk, and an entrance fee is charged. 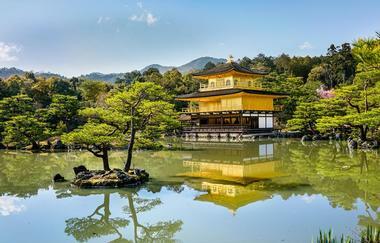 Known in English as the Golden Pavilion, Kinkaku-ji is a Zen temple whose top two stories are completely coated in pure gold leaf. Each floor of the three-story pavilion was built in a different architectural style, with the first floor done in the Shinden style, the second in the Samurai style, and the third in the Zen style. The pavilion's surroundings are breathtaking as well; the building sits in a beautiful landscaped garden and extends over a large pond that reflects its image. The property is open to visitors every day between 9:00am and 5:00pm, and a small admission fee is charged. 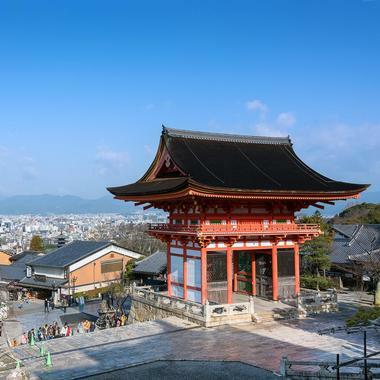 Founded in 780, Kiyomizu-dera is an independent Buddhist temple named after a waterfall that sits at the base of the temple's main hall. The waters are split into three streams; the water of each stream is believed to have a different benefit, and visitors can drink the water using cups attached to large poles. Another highlight is the wooden platform that protrudes from the main hall and offers excellent views of Kyoto and the surrounding forest. The temple is a breathtaking destination at any time of the year, but it's particularly beautiful during the autumn leaf season in late November. 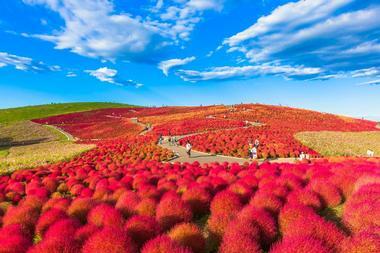 Located inside Hitachi Seaside Park, Kochia Hill is covered with more than 35,000 kochia bushes. The short, round shrubs are green for most of the year, but at the end of the wet season in late September, they take on a fiery red color that leads some people to call them the "burning bushes." 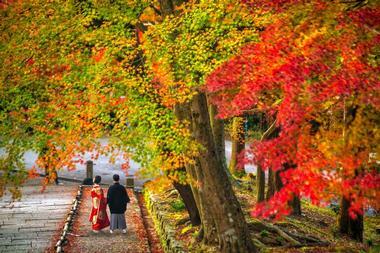 The color lasts well into October, and a festival is held when the bushes are at the peak of their brilliance. The colors are just as beautiful when viewed from a distance as they are up close, but plenty of walking paths wind their way across the hillside. 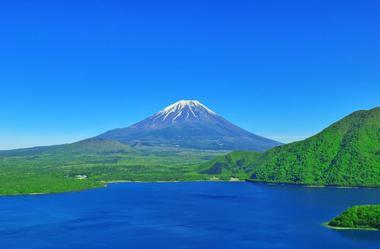 Standing 3,776 meters above sea level, Mount Fuji is the highest mountain in Japan. Thanks to its almost perfectly conical shape, the peak is one of the country's most recognizable symbols and has been worshiped as a sacred mountain for centuries. The mountain is located only 100 kilometers away from Tokyo and can be seen from the city when the sky is clear; visibility is typically best during the early mornings and late evenings. Anyone who would like to get closer to the mountain can visit the Fuji Five Lake region or the nearby hot spring resort of Hakone. The former residence of Shogun Tokugawa Ieyasu, Nijo Castle is often considered to be Japan's best surviving example of castle architecture from the feudal era. The castle is composed of three separate parts: the Honmaru (first ring of fortification), the Ninomaru (second ring of fortification), and the peaceful gardens found between the two main rings of fortifications. Only the Ninomaru Palace and the gardens are regularly open to visitors, although the Honmaru Palace is sometimes opened to the public for special occasions. English audio guides can be rented from a kiosk just inside the main gate. Dedicated to Tokugawa Ieyasu, founder of the feudal military government known as the Tokugawa Shogunate, Nikko Tosho-gu is a spectacular shrine complex composed of more than a dozen separate buildings. Unlike most Japanese shrines, Nikko Tosho-gu features a number of buildings decorated with elaborate wood carvings and pure gold leaf. 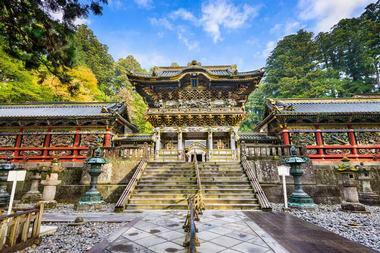 The complex contains elements of both the Shinto and Buddhist religions, and is set in a beautiful evergreen forest. Five of the structures here have been declared National Treasures, but highlights include the five-story pagoda at the entrance and the grave of Ieyasu, which can be accessed by climbing hundreds of stone steps. 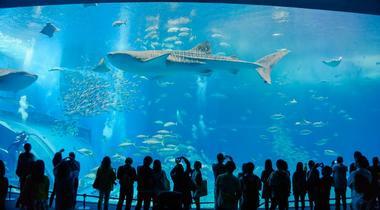 Part of the Ocean Expo Park, the Okinawa Churaumi Aquarium consists of four floors and is home to roughly 740 different species of deep sea creatures, tropical fish, corals, and sharks. There are a total of 77 tanks in the aquarium, but the main tank is known as the Kuroshio Sea; 115 feet in length, it has a glass viewing panel that measures 24 by 74 feet and is home to whale sharks, manta rays, and a wide variety of tropical fish. Various shows take place every day, and it's advisable to plan your visit around the shows you would like to see. The most famous rock garden in Japan, Ryoan Ji is almost 3,000 square feet in size and is part of a large temple complex that shares the same name. Believed to have been constructed around the year 1500, the rock garden is made up of 15 small boulders sitting on a bed of white gravel that is carefully raked by the monks every day. The garden is arranged so that it's only ever possible to see 14 of the boulders at a time, but legend has it that anyone who achieves enlightenment will be able to see all 15 at once. Only 30 minutes away from the downtown core of Kyoto, the Sagano Bamboo Forest is one of the most photographed places in Japan. 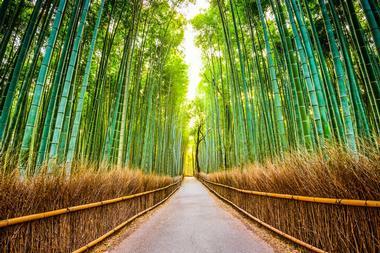 The densely packed bamboo trees stretch up into the sky, creating a peaceful canopy and an otherworldly atmosphere. Wooden pathways wind their way through the trees, which create a unique rustling sound when they wind passes through them. The noise is so lovely that the Japanese government has recognized it as one of the "100 Soundscapes of Japan." The forest is always open and there is no admission fee, but the least busy times tend to be weekday mornings and evenings. 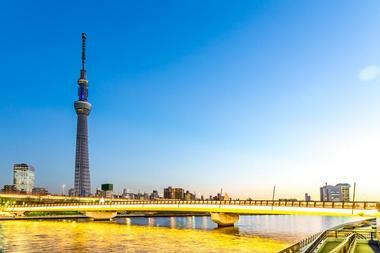 As the tallest structure in Japan, the Tokyo Skytree is easily one of the city's most prominent landmarks. The top of the tower sits at 2,080 feet, while observation decks can be found at 1,150 feet and 1,480 feet. The lower deck spans three levels: one with a cafe and glass panels that offer a view of the bottom of the tower, one with a restaurant and gift shop, and a third with large windows that provide stunning panoramic views of the city. A separate admission ticket is required for the second observation deck, which boasts a spiral, glass-covered skywalk. 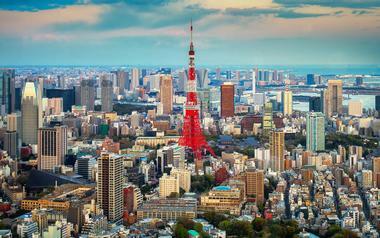 Inspired by the Eiffel Tower, the Tokyo Tower was built in 1958 and is painted bright orange and white. Standing 1,092 feet high, the building was the country's tallest structure until 2012 and is now the second tallest. The tower's main observatory sits at 492 feet and can be reached either by elevator or by climbing a set of 600 stairs; from here, elevators bring visitors up to the special observatory, which sits at a height of 820 feet. Directly underneath the tower, visitors will find a variety of museums, shops, and restaurants in a four-story complex known as FootTown. Located inside the Kawachi Fuji Gardens in Kitakyushu, the Wisteria Tunnel is undeniably one of Japan's most magical floral attractions. 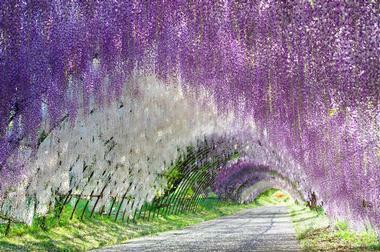 Sitting at the entrance to the park, the two 328-foot-long tunnels are made out of approximately 150 separate wisteria plants belonging to 20 different species. Hanging down in lush cascades, the flowers bloom in various shades of purple. You shouldn't miss the opportunity to stroll through the tunnel, but great views can also be had from a nearby hilltop viewpoint. The best time to visit is during late April or early May, when the flowers are in full bloom. 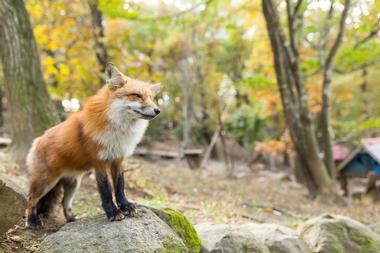 Founded in 1990, the Zao Fox Village is a unique petting zoo that is home to more than 100 foxes, which the Japanese traditionally believe to be messengers of the Shinto god Inari. The majority of the animals here are Japanese red foxes, but there are six different species to be found in total, including Arctic foxes, black foxes, and platinum foxes. It's possible to purchase small amounts of food to feed the foxes, but to prevent any accidental nips, visitors are encouraged to throw the food on the ground rather than feed the animals by hand. With more than 2,000 tons of seafood passing through its stalls every day, the Tsukiji Fish Market is easily one of the largest fish markets in the world. The market is divided into two sections: the inner wholesale section and the outer market, whose shops and restaurants cater to the public. Lucky visitors may be able to catch the tuna auction, which takes place every day at 5:00am and is limited to 120 people. Most of the shops in the outer market are open between 5:00am and 2:00pm, while the wholesale market opens to the public at 10:00am.